My parents just celebrated there 70th wedding anniversary. My siblings & I wanted to mark this milestone with a family party, including out of town family members. Also, to make it easy on my parents we decided to host it in their home, but we would do all of the work. 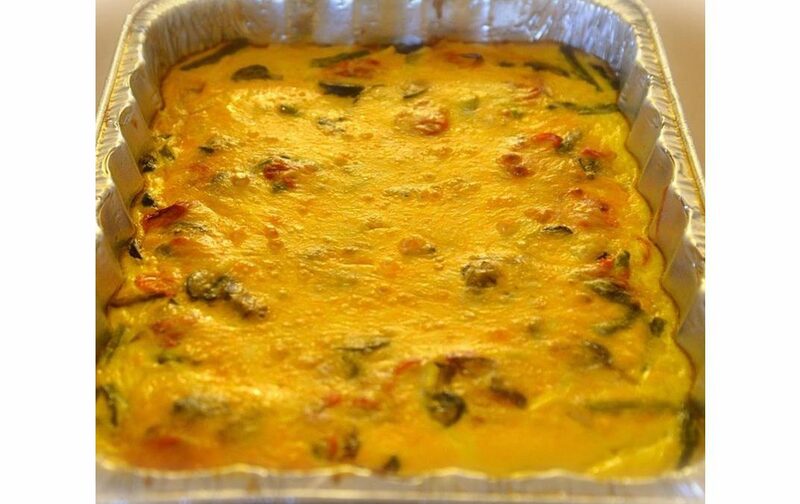 Since I love to cook, not only did I make some dishes for the actual party, but I also volunteered do a make-ahead breakfast casserole for the out of town family members staying at my parents. I wanted something that I could put together the evening before and take over for them to cook the following morning. This did create some challenges, because when you’re making something for 8-10 people, there’s probably going to be dietary considerations. In this case, I had to deal with a gluten intolerance, a bell pepper allergy, & a preference for no meat. That led to a search on Pinterest. 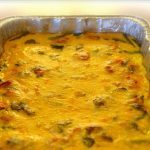 This casserole is modified from several different casserole recipes that I found. Probably the best part of this recipe is that you can customize it to your own tastes & what’s in season. Love bell peppers, use them. Hate mushrooms, don’t use them. Need to have your bacon or sausage “fix” add a pound of cooked bacon or sausage. Worried that the hot sauce will create too much heat, skip it, although, my mother can’t eat spicy foods and deemed the heat “just right”. I made this casserole in a disposable tin container because I was taking it to my parents the night before. For a greener choice, make it in a 13x9 casserole dish. This recipe is very versatile. The vegetables I'm including are the ones that I like. Feel free to substitute or add other vegetables, such as zucchini or bell pepper. Also, when vegetables roast the volume is cut about in half, so what looks like way to many vegetables turns out just fine. If using baking setting, preheat oven to 450° (425° for convection baking) and position rack in center. If using convection roast, preheat to 350° and position rack in the lowest position. Place vegetables in preheated oven. If using convection roasting place on the lowest rack, other wise, place on center rack. Roast for 10 minutes. Using spatula flip vegetables and roast for an additional 10 minutes. While vegetables are roasting, whisk together eggs, ­½ & ½, and hot sauce until combined. Add cheese. Generously coat a 13x9 pan with vegetable spray. Layer the potatoes in even layer, patting in place. Distribute the roasted vegetables evenly over the potatoes. Pour the egg mixture over the vegetables and move pan side to side to distribute evenly. Sprinkle cheese over the top. Bake at 350° for 45 minutes, until eggs are set. Let stand for 5 minutes before serving.